Hey guys! I pulled a super late day at the lab and then had to rush to my parents' house in another city to get ready for InterventionCon. I did not get a chance to finish the page, but you can find the inked version in the forum (look for the What it Takes forum). I will be driving all day this morning to get to Intervention SOMEWHAT on time, and the convention lasts until the 12th! Use the code-word Kerfluffle to get a free sketch at my table! Hope to see you there. 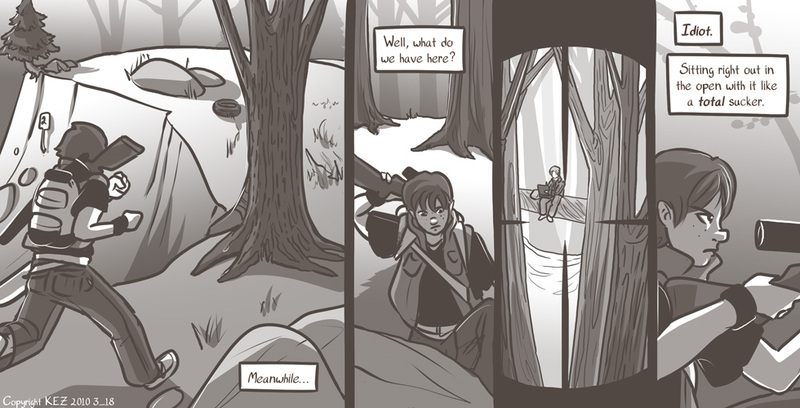 Friday's page will be up on Monday, so the comic will update MWF next week! Well look who remembered to draw Colbey looking through the scope from the CORRECT angle? I don't know when I will be offering extra updates again, but I hope it will be soon. Until then, W/F!